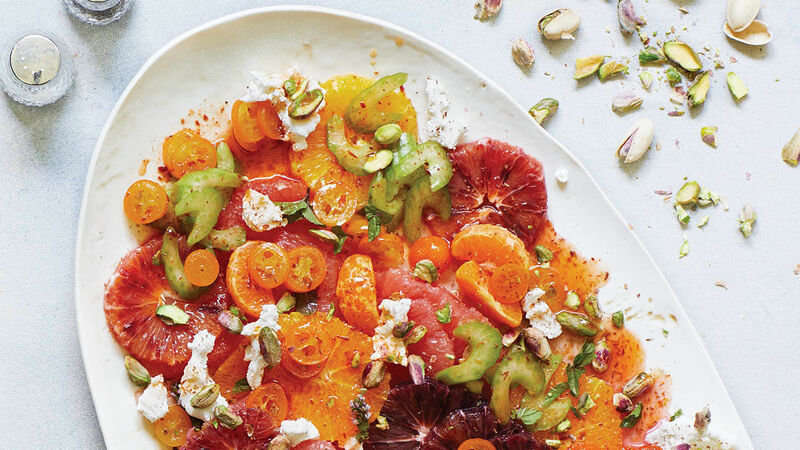 This sunshiny salad with subtle Moroccan spices is a colorful addition to any meal. Making candied kumquats is easier than you might think. Briefly blanching the fruit slices removes excess bitterness, and the finished syrup is deliciously intense. Their sweet-tart flavor takes this salad to another level. In a large bowl, whisk the kumquat syrup, vinegar, harissa, and a pinch of salt. Whisk in the oil. Add the celery to the bowl, and toss to coat. Peel the clementines, removing all of the white pith. Break into segments, and add to the bowl. On a cutting board, using a thin, sharp knife, cut the peel and pith from the grapefruit; cut to separate the fruit from the membrane, and add the fruit to the bowl. Cut the peel from the oranges, then slice crosswise into 1/3-inch-thick rounds; add to the bowl. Add the chopped mint, and toss well, then transfer to a serving platter or individual plates. Crumble the goat cheese over the salad, and sprinkle with the pistachios. Dot generously with candied kumquats, and dust with cinnamon. Garnish with small mint leaves. Really good flavor combination. Goat cheese and citrus play well together and the celery adds a nice crunch. The spice of the harissa perked things right up. Why does one make so much candied kumquats when you only need 2 1/2 TBS for the recipe and I TBS of juice?